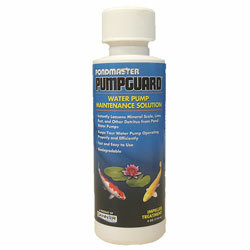 Pondmaster PumpGuard is an easy maintenance solution to keep water pumps running like new. It quickly cleans calcified, dirty pumps within minutes. Danner recommends consumers to use Pumpguard every six months to insure proper operation of their pumps. PumpGuard is safe for use with plastic, ceramic, rubber, PVC, titanium, copper, nickel, and short term use with stainless steel.